MS&LR? The Manchester Sheffield and Lincolnshire Railway! This coach was originally built in 1888, before the MS&LR became the now familiar Great Central Railway in 1897. The coach has had a long and chequered history. Withdrawn from passenger service in the early 1930s by the London & North Eastern Railway it was converted into a holiday ‘Camping Coach’ and rented out and delivered to anywhere on the network with easy access, including seaside, holiday and remote country destinations. This ended in September 1939, at the outbreak of WW2, when it was transferred to departmental use. 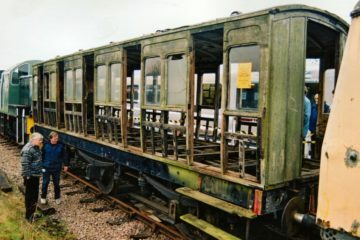 The coach was stripped out, one end removed, and then it was used for storing locomotive components. After the war it eventually ended up on a farm as a ‘shooting lodge’. 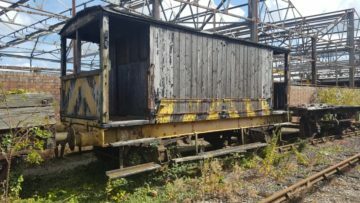 By the time it was saved by the volunteers of the GCR Rolling Stock Trust, it was in a dreadful state, so much so that it took 16 years to return it to its original condition, both inside and out. It looks as good now as the day it was built. 946 will eventually be housed at the GCR’s new railway museum at Birstall, Leicester. However, until the museum is complete (sometime in 2020/21), we will be displaying 946 in our railway museum. We are in the process of creating display boards, so that you can follow the renovation of this wonderful coach. We also hope to install a viewing platform so that you can see inside. We have put together two short videos. One covering the dedication service, and a second its arrival at Mountsorrel. Not every exhibit arrives in a pristine condition! 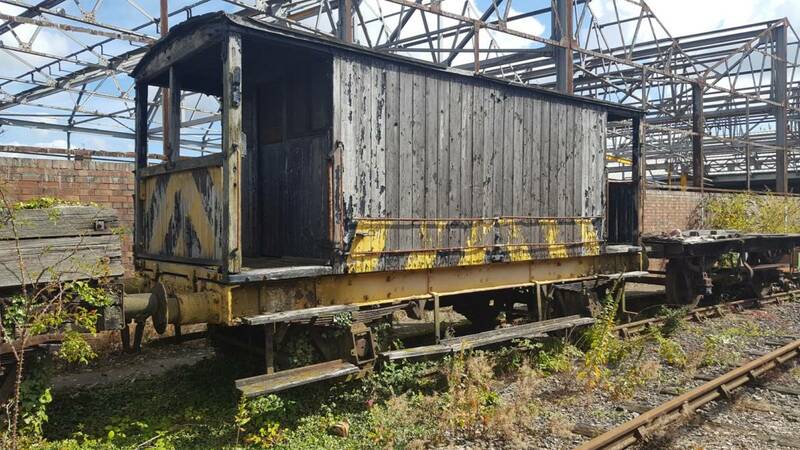 Midland Railway Brake Van awaiting restoration. I’m pleased to say that Snibston have kindly agreed to loan us the brake van pictured below. The running gear requires attention as the vehicle hasn’t been used for 20 years and it will ultimately need new springs. The body work isn’t too bad though! The intention is to restore and repaint the timber work as the first phase of restoration. The livery will be 1920’s Midland Railway. As a second stage it would be nice to restore the interior to original condition and replace the stove which is missing. Finally we would tackle the running gear. The duration for all three restoration phases is 2 years and the hope will be to obtain a grant to find the new parts and paint required. Once fully restored LCC would transfer ownership of the vehicle to MARCH. The recently opened ‘mini-meadow’ path, accessible from the Heritage Centre patio, has been very popular with visitors. 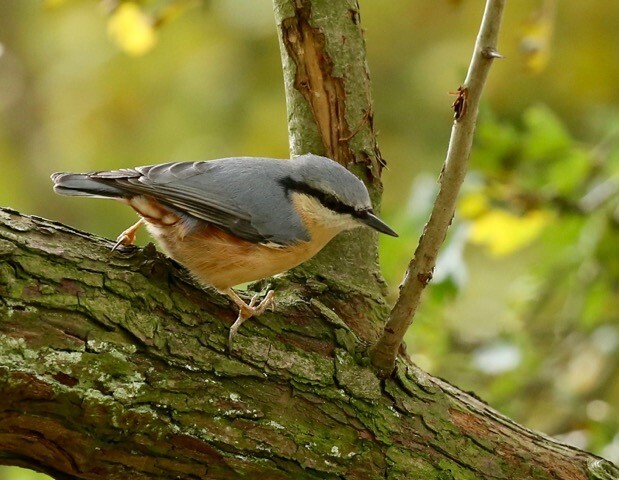 On sunny days, visitors of all ages have delighted in observing several species of butterfly at very close range as well as the wild flowers and grasses that provide an excellent foraging ground for other insects including grasshoppers and bees. Around the quarry area itself, large numbers of colourful dragonflies have been seen enjoying the bursts of sunshine and the extra heat, captured by the encircling quarry walls and wild-flower banks. The area set aside for den building in the Spinney has been well received and is much in demand, producing many interesting den styles. Whilst the beauty and interest of the Nunckley Trail remains a great attraction. As we enter Autumn, volunteers will be working on preparing the meadow for next year, repairing Hazel hurdles and Willow seats and planting perennial wild flowers. Our Badgers and other woodland mammals will be munching their way through as many calories as they can to be ready for their Winter sleep and visitors will see evidence of their foraging around the woodland. There is much activity at the bird feeding station too whilst open Hazelnut shells on the ground are a sure sign that hungry squirrels and Wood mice are also fattening up for the Winter. We are now offering pre booked site tours for groups. One of our knowledgeable volunteers will take your group around the site showing all the areas of interest and providing background information and stories that you wouldn’t normally see or find out about. Tours last from an hour to 90 minutes and can be tailored to each group’s specific interests. For example, tours can be ecology themed, history themed or a combination of both. Tours cost £5 per person, with a 50% non returnable deposit payable at the time of booking. If there are more than 20 in your group then the cost is £5 each for the first 20 and £4 each for everyone attending above that number. Tours are available to start between 10:00am and 3:30pm 7 days a week. For more details please email enquiries.2019@heritage-centre.co.uk stating the date and time you are interested in and the approximate number in your group that wish to attend. Stop Press! Train days 21st and 22nd October. 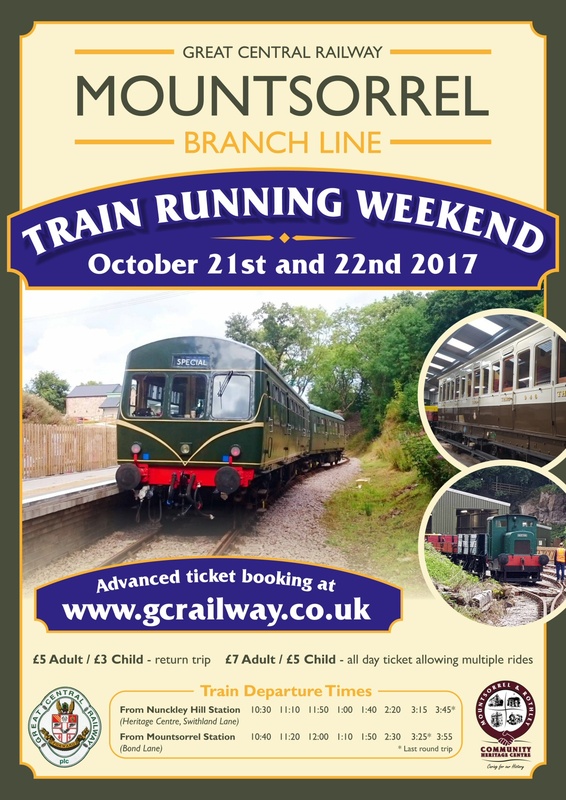 We have just heard that a shuttle train (from Mountsorrel via Nunckley to Swithland and return to Mountsorrel) will next be running on the Mountsorrel Branch Line on the 21st and 22nd October. The trains will be made up of the carriages forming the GCR’s heritage diesel multiple unit (DMU). Trains will run between Bond Lane and Swithland sidings, stopping at Nunckley Hill, and will run approximately every 40 minutes between 10:30am and 3:45pm. The trains will not join the GCR main line. Ticket prices are £5 for adults, £3 for children, and are available to purchase from the GCR’s website.